You might have tried the popular dish, lemon chicken. So have I. It's my favourite dish too. You can easily find lemon chicken on the menu at any Chinese restaurants. 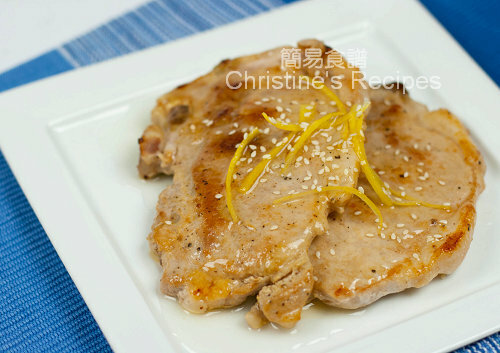 Well, ever tried lemon pork chops? I wasn’t quite sure how the taste it would be like if lemon goes with pork until I experimented cooking the dish the other day. 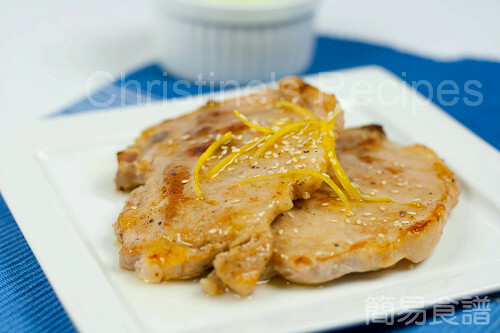 The juicy and tender pork chops, drizzled with sweet and sour lemon sauce on top tasted fantastic and appetizing. As this dish was an experiment, I only cooked two pieces of chops. If you’d like to cook and try how the taste is like, double the size or increase the amount according to your preference. As the pork chops are to be pan-fried, I find thin pork loin is the best choice for this recipe. Keep the time of frying pork chops as short as you can, to the point that it’s just done so that the meat won’t be too dry. Rinse pork chops and wipe dry with kitchen papers. Tenderize pork chops with back of chopper. Add crushed garlic and chopped shallot into marinade, then marinate pork chops for 30 minutes. Heat 2 to 3 tablespoons of oil over medium heat. Pan-fry pork chops until both sides are lightly golden and done. Remove from pan and soak up excess oil. Arrange pork chops on a plate, covered. Cook sauce with a little oil until it boils. Add thickening and cook to your preferred consistency. Pour sauce over pork chops and sprinkle fried sesame. Garnish with lemon slices if you like. Serve hot. I love lemon chicken. I bet the sauce goes very well with pork chops too. I know I'll love it. This pork loin dish must go very well with some pasta! oh how lovely..this would be great for wednesday..our hump day as motivation to work thorugh the week..
Hi Christine, this dish looks so tasty. I often dread how to prepare pork chop as my family gets quite picky with pork dishes. I know for sure this recipe will make my boys salivade. Lemon sauce...mmmm. Thanks for the recipe! Really nice dish. Very elegant in presentation but vibrant in flavor. They're beautiful! And the lemony flavor sounds excellent! The sauce sounds very easy to make. Thanks! My husband like lemon chicken a lot. Thanks for this recipe. I will give this a try tomorrow, hope it will come out picture perfect like your pork chops do. This looks awesome. Will give it a try. Hope it will be picture perfect too.